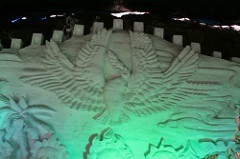 Those in Beijing between January and March should pay a visit to the magical Longqing Gorge Ice and Snow Festival. The magical winter wonderland provides a fun day out for locals and tourists alike at the ice spectacle held annually just north of Beijing. Marvel at the intricately carved ice sculptures and ice lanterns on display, while fireworks turn the icy gorge into a colourful light show. Visitors can try their hand at ice-fishing, tobogganing, ice-slides, skating, or one of numerous other ice or snow sports. There is also a human-sized ice maze to get lost in. Looming spectacularly above all the attractions and activities there is a 230 feet (70m) high frozen waterfall. There is something on offer for all age groups, making for a thrilling excursion for the whole family. Longqing is under two hours' drive from central Beijing so it is possible to visit just for a day, but, as the ice sculptures are at their most beautiful and magical at night, it is recommended that visitors stay in the area overnight to enjoy the full experience.